General Merrill A. (“Tony”) McPeak entered the Air Force in 1957 as a Distinguished Graduate of the San Diego State College ROTC program. A career fighter pilot, he spent two years with the Air Force’s elite aerobatic team, the Thunderbirds, performing before millions of people in nearly 200 official air shows in the U.S. and overseas. He flew 269 combat missions in Vietnam. Senior leadership assignments included command of the 20th Fighter Wing in NATO, the Twelfth Air Force (and concurrently U.S. Southern Command Air Forces) and the Pacific Air Forces. 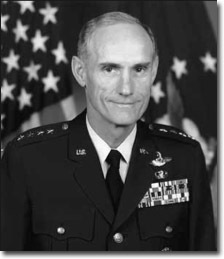 He was Air Force chief during a period of very active US involvement overseas, including Operation Desert Storm. While leading the Air Force, he conceived and executed the most extensive reorganization in its history, creating a service better suited to meet the nation’s defense needs.In 1992, San Diego State University honored General McPeak with its first ever Lifetime Achievement Award. In 1995, George Washington University gave him its Distinguished Alumni Award, the “George.” He was among the initial seven inductees to the Oregon Aviation Hall of Honor. He is a member of the Council on Foreign Relations, New York City, and in 2008 was a national co-chairman of Obama for President. In 2010, President Obama appointed General McPeak to the American Battle Monuments Commission. The Commissioners subsequently elected him Chairman. See General McPeak’s official Air Force biography, which includes education, assignments, flight information, major awards and decorations, and effective dates of promotion.